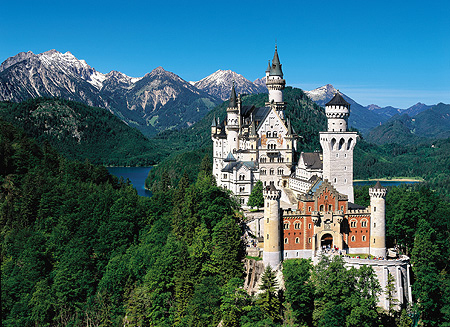 Neuschwanstein Castle, which King Ludwig II built on a rugged hill against a backdrop of picturesque mountain scenery, was prompted by the idea of rebuilding an existing ruin "in the authentic style of the old German knights' castles", as he wrote in a letter to Richard Wagner. The castle was built by Eduard Riedel and Georg Dollmann from idealized sketches by the scene painter Christian Jank. While the building itself imitates the 13th-century Romanesque style, the paintings inside predominantly depict scenes from Wagner's operas such as "Tannhäuser" and "Lohengrin". 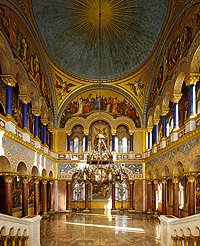 The Singers' Hall is modelled on the banqueting hall of the Wartburg near Eisenach; the decoration includes wall paintings illustrating the Parzival saga. 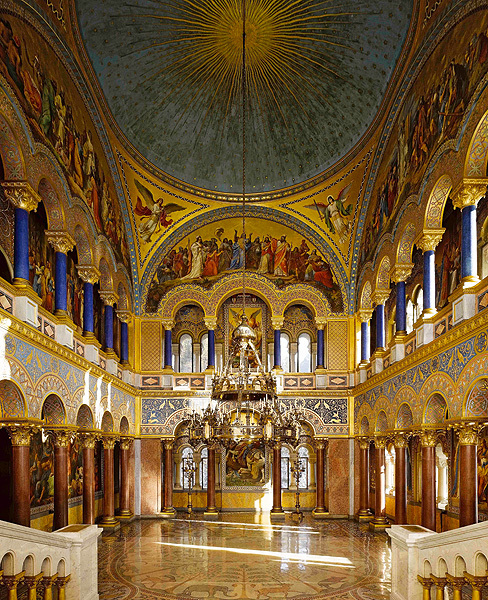 The church-like Throne Hall was modelled on Byzantine domed architecture and the Allerheiligenhofkirche (Court Church of All-Saints) in the Munich Residence and symbolizes Ludwig II's idea of a monarchy by God's grace. Neuschwanstein is not a copy of a medieval castle but a typical Historicist creation. Tickets with a specific visiting time can be reserved for an additional prepaid charge two days before the desired castle visit (3 pm local time) at the latest. The visiting time can only be changed or the ticket cancelled up to 2 hours before the start of the tour (also by phone). on your castle visit you will find on www.neuschwanstein.de. We offer guided tours in German and English (approximately 30 minutes). Audioguide tours are available in nineteen languages. There are coach trips up the mountain which end below from the castle.